As reasons for brewing a beer go, creating one that punters might struggle to pronounce at the bar is one of the more spurious we've come across. 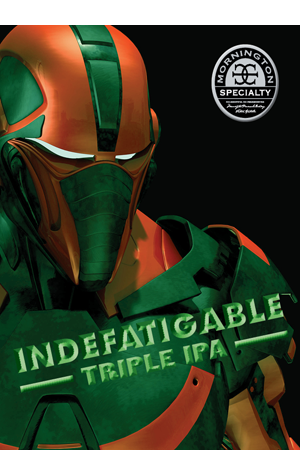 Although given Indefatigable is an 11 percent ABV hop explosion, we imagine anyone going back to the bar for a second or third might struggle to pronounce it even if it was called Bob. Inspired by the extremely hopped ales popularised by West Coast USA brewers, it's tagged as a "triple IPA" thus slotting in at the upper end of the brewery's series of IPAs released over the past five years. It comes "heavily dosed" with Amarillo, Citra, Galaxy and Centennial with brewer AG describing it as "hop excess" centred around "bold, pungent, citrus and stone fruit aromas paired with a hefty resinous hop assault on the palate" that, he reckons, make it "an extreme beer for those who dare". Given indefatigable means "incapable of being tired out" and hops are known to have a soporific effect, it sounds like quite the challenge.